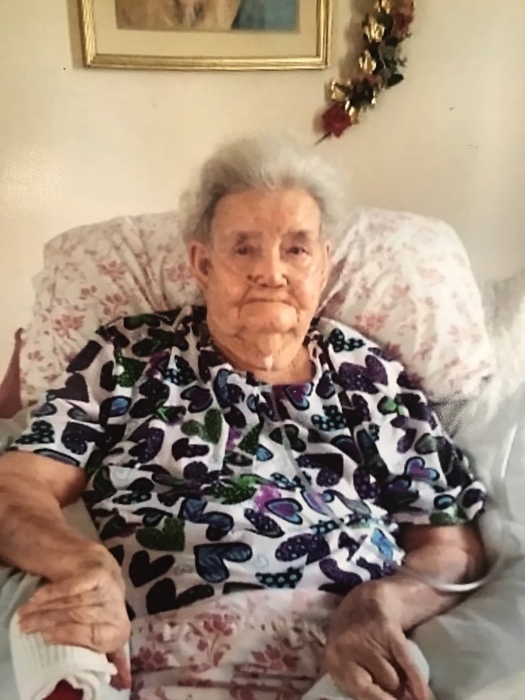 Annie Mae Jernigan Prevatte age 97 of Whiteville passed on Wednesday, January 23, 2019 at New Hanover Regional Medical Center in Wilmington. She was the daughter of the late Junie Jernigan and Dessie Doors Jernigan. She was also preceded in death by a son, Bobby Ray Prevatte; 5 siblings, Paul Allen Jernigan, Archie Jernigan, Beulah Prevatte, Clarice Jernigan Bryant, Betty Jernigan Merritt and Benjamin Jernigan. She is survived by four children, James Junior Prevatte of Evergreen, Shirley P. Lee of Chadbourn, Jeri Sue Prevatte Nance of Evergreen and Polly Prevatte of Whiteville; 6 grandchildren: 9 great-grandchildren and 7 great-great-grandchildren. Funeral Services will be conducted on Saturday, January 26, 2019 at 2:00 p.m., in the Worthington Funeral Home Chapel; The Reverends Donny Jernigan and Bobby McNair will officiate the service. Interment will follow in the Flynn Cemetery. The family will receive friends from 6:00-8:00, Friday evening at Worthington Funeral Home.